Not a particularly happy New Year in the Matron household. Poor Buddy had a small stroke yesterday. He will be 14yrs old on Sunday. The vet said there is really no treatment for strokes in dogs, and he may make a full recovery. Have a look at my new linked blog Matron's Dogblog for a fuller explanation of stroke. He just looks very dizzy at the moment and can't stand up for long. Lots of bed rest and TLC. I'm not looking forward to protecting him from the fireworks tonight! I wish you all a Happy New Year! Hi Ho, Hi Ho, it's off to work I go! Wishing everyone out there in blogland a Happy Christmas! from Matron and Buddy! So I've collected the goose, now I have two sticks of sprouts! I love sprouts! I might have a bit of a job digging up my leeks, but as I'm working on Christmas Day and we appear to be thawing out a bit in London, I might be able to get a fork in the ground on the 26th! Do you remember 'B' from Matron's Dogblog? 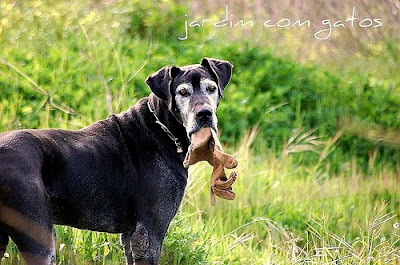 Our blogging friend Gintoino has just lost his best friend. Please pop over to Jardim com Gatos to send him your best wishes. Do you know where all the ingredients of your Christmas Dinner are coming from? One of these lucky birds will be taking pride of place on our dining room table on Christmas Day! Iam indeed fortunate to have found a friend with a smallholding, and I went to pick up my goose yesterday! This has to knock spots off the plastic wrapped pale, frozen offerings in most supermarkets? What do I blog about in Winter? It's not hard in the Summer to find things to blog about. But what to blog about in Winter when nothing is happening. My favourite trug? One hundred and one things to do with a wheelbarrow? a watering can? Does anyone have any ideas? The South of England has been covered in a heavy snowfall overnight. I am pleased with the way these hardy Winter lettuce appear to have stood up to the extreme cold. These garlic chive flower heads look lovely with their snow hats on! Buddy enjoyed himself too! We had a few hours of bright sunshine this afternoon so decided to go for a walk on the common! What are your Garden Plans for Next Year? Next year I intend to grow an F1 variety of Brussels Sprout for the first time on my allotment. I look forward to swapping seeds with fellow enthusiasts. I intend to tidy up my chaotic collection of seed packets in scruffy biscuit tins. What are your garden plans for next year? The most vibrant place in Funchal, the capital of Madeira, is the local market. I was interested to see these trombone squash tromba d'albegna as it is a variety that I look forward to growing next season. I also bought some strings of paprika peppers which I will dry in my dehydrator and make paprika powder. I suppose I will also be looking for a good goulash recipe too! These monsters are an unusual eel like fish which is caught in the sea off the coast. They are known as Espada fish. Here are another couple of stray dogs chilling out in the sunshine. I've just returned from a glorious short break on the island of Madiera. The weather was wonderful, mostly 70degrees and bright sunshine. My favourite place on the island is the colourful and vibrant fruit and veg market. When fruit is properly ripened where it was grown it has a heavenly scent. Guavas, pineapples, passionfruit and custard apples are fantastic here. I also took time to visit a friend who runs a small charity feeding and neutering stray dogs on the island. Here are some of my old friends! More pics to follow, when I have unpacked! Matron is off to Madeira again! Just for a couple of days to enjoy the warmth of the sun. It's 70degrees and sunny right now. Baxoon! My heavy London clay soil seems to be ideal for these Jerusalem artichokes. It's extremely muddy down on the allotment at the moment so they took quite a bit of scrubbing with the garden hose and a brush to get them clean. They always seem to be a bit of a fiddle to prepare and cook. Today I roasted some in the oven but the skins were still thick and leathery. Steaming seems to be a better option but still a bit fiddly. Does anyone have any handy hints for preparing artichokes? Whatever it takes, I am a big fan and I adore them! Here's one of my lovely Crown Prince pumpkins. What an amazing colour! I always roast them in the oven, it tends to evaporate some of the water. Blog readers will know that once every 5 weeks I get a half day off work, and I like to play 'tourist in my own town'. Today I took the train to the East side of London to have a look at the building works for the London 2012 Olympics site. The roof of this stunning London Aquatics Centre is up already. This wonderful design by a female architect Zaha Hadid is supposed to be a 'wave shaped' roof. Am I alone in thinking that it looks like a Pringles potato crisp? The main Olympic stadium is largely built now. I took the tube down to Stratford today, the main building site is in a triangle between Stratford, Hackney Wick and Pudding Mill Lane stations.